Wonderful set of rare Patrick Macnee and Twiggy slides, Chris. Hurray!!! Mood up, many thanks! Earlier on the Internet, I was able to find only two of this part of photo session. Patrick in white shirt on this set for some reason always reminds me of Hamlet. Wish I would see more photos with Patrick with a sword: one, and with Twiggy. Well, it's rather unusual approach, as a rule in photo shoots Patrick was either empty-handed or with an umbrella/bowler or with a firearm. P.S./ Interesting info: there is an exact date for this shooting - this was held on 4 January 1967. 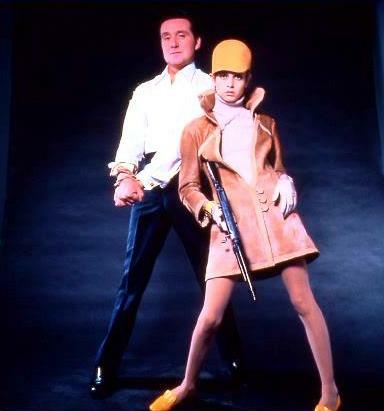 Some great photos here...Steed is certainly having fun and Twiggy looks energetic....and The Twig would probably have been well capable of filling the boots of stunning New Avenger Joanna Lumley so much Fitter and stronger looking was the Twig she then !